Ultra Real-sounding Virtual Acoustic Guitar - The true sound of Gibson® 1963 Hummingbird! 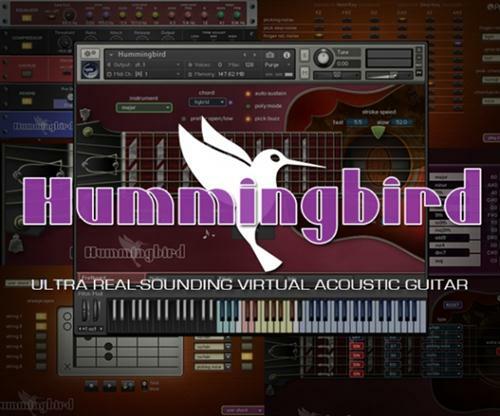 Hummingbird enables you to compose and create powerful and natural acoustic guitar tracks that imitate real acoustic guitar playing! * Hummingbird uses the Lossless Sample Compression format 'NCW' with real-time encoding. The data size after the installation is approx. 40.3 GB that equals 80 GB of .wav files. With Hummingbird SPI, you can play ultra realistic acoustic guitar performance in real-time. You can access various playing techniques instantly without stopping your performance and create convincing guitar tracks very quickly. Single note, Emulated 2-strings dyad chords (minor 2nd, 2nd, minor 3rd, major 3rd, 4th, flat 5th, 5th, #5th, 6th, 7th, maj7th, octave), Sampled real chords (octave, major, minor, 7th, m7, maj7, add9, sus4, 9th, m7(9), maj7(9), dim7, aug, open / low chords, etc. ), Emulated chords (major, minor, 7th, m7, maj7, add9, sus4, 7sus4, 9th, #9, m7(9), maj7(9), dim, dim7,m7-5, aug, open / low chords, etc. ), User chords (You can make any chords using User Chord Editor. ), Realtime Hammer-on & Pull-off, Realtime Legato Slide, Vibrato, Trill, Picking Tremolo, Mute & picking noise, Gliss down, Natural Harmonics, Percussion, Fret noise, Pick stop noise, Bridge mute noise, Release noise, Position change noise, Special FX, etc..
You can play ultra realistic acoustic guitar performance in real-time! The SPI automatically selects a proper string / fret position depending on the situation. You can also change the string manually by key switches. The Fretboard Monitor visualizes the current fret position / playing technique you are playing. You can instantly select an instrument (articulation) using the Instrument Select Key Switches. All the instruments can be assigned to any key switches and you can create your own key switch mapping. The key switches have a chord recognition feature that enables you to select a chord instrument by not only hitting a key that the chord is assigned, but also by hitting the chord notes in the key switch range. In other words, you don't need to memorize the key switches for the chord instruments. Just hold the chord notes in the key switch range, and you are ready to play the chord. The extensive number of the 'real' chord samples makes your guitar tracks very convincing. (octave, major, minor, 7th, m7, maj7, add9, sus4, 9th, m7(9), maj7(9), dim7, aug, open / low chords, etc.) Hummingbird includes the huge number of 'real' recorded (in other words, 'pre-recorded' or 'pre-played') chord samples. You can instantly access the various types of guitar chords. Prominy's guitar libraries are the only ones that include such a huge number of the real chord samples. Though Hummingbird already includes a huge number of real chord samples, more chords (and more chord shape variations per each chord) are available with the emulated chords. Our unique recording / programming make it possible for you to get a realistic chord sound that is close to a real sampled chord sound, even if you are playing emulated chords. minor 2nd-dyad , maj2nd-dyad, minor 3rd-dyad, major 3rd-dyad, 4th-dyad, flat 5th-dyad, 5th-dyad, #5th-dyad, 6th-dyad, 7th-dyad, maj7th-dyad, octave-dyad, major, minor, 7th, m7, maj7, add9, sus4, 7sus4, 9th, #9, m7(9), maj7(9), dim, dim7, m7(b5), aug, open / low chords, etc. Hummingbird includes a larger number of percussion samples (hitting, tapping, knocking the various part of the guitar's body) that enable you to play and create percussive and rhythmic guitar tracks. As well as the User Chord Editor, you can configure how each string is played when you hit the Strum Keys and the Normal Key. Arpeggio Key is a dedicated key for each string. When a chord instrument is selected, each note of the chord is automatically assigned to the Arpeggio Key for the string so you can play arpeggio with the keys. *This is not a so-called �?Arpeggiator'. This is a feature that enables you to play a certain note (string) of the chord individually. The samples were recorded using three microphones; a pair of small diaphragm microphones for stereo recording, and one large diaphragm microphone for monaural recording. As a stereo option for the large diaphragm microphone, a Double-Tracking instrument is available (see below). In addition to the stereo recorded samples that capture a natural stereo sound, Double-Tracking instruments are available as another option to get a stereo sound. �?Double-Tracking' is a technique that is frequently used in recording guitar tracks. It gives the guitar track a nice, wide-spread stereo images and thickness. With Hummingbird SPI, you can reproduce it very easily just by loading the double-tracking instruments. No identical samples are played simultaneously in both channels. You don't need a stereo delay or tweaking your midi data to emulate the double-tracking. With Hummingbird's Realtime Legato Slide feature using 'real' legato samples, you are able to get perfectly real expressions of the human finger's legato slide that cannot be reproduced with a slide emulation by changing pitch. Hammer-on & Pull-off samples are real recorded samples as well. Realtime Legato Slide is available with all the instruments including chord instruments except FX instruments and Percussions. Realtime Hammer-on&Pull-off is available with single note instrument. With the SPI's Auto Stroke Detection feature, SPI automatically detects the current beat position and identify proper stroke direction (down or up). There are several stroke detection modes and you can also control stroke direction manually. Prominy Hummingbird Acoustic Guitar V.1.00 C KONTAKT download links are externally hosted on Extabit, Rapidshare, Rapidgator, Netload, Uploaded and Prominy Hummingbird Acoustic Guitar V.1.00 C KONTAKT also available directly on Torrent Sources.